4 Ea. 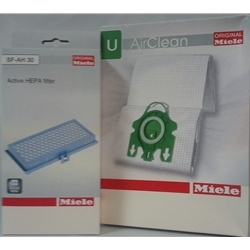 / One Package Miele U Air Clean Bags. Are you confused to which bags and filters to purchase for your Miele. We've made it simple for you. If you have allergies and your Miele upright is a Twist, Salsa, Home Care, Calypso, Cat and Dog, Bolero, Tango or Swing, this kit is for you. Your entire order ships for free when purchasing this kit. Chose your package option below. 4 Ea. / One Packages Miele U Air Clean Bags. Each Package contains 4 Bags, One Bag Conpartment Filter, One Super Air Clean Filter. 16 Ea. / Four Packages Miele U Air Clean Bags. Each Bag Package contains 4 Bags, One Bag Conpartment Filter, One Super Air Clean Filter.